Married 25 years, Trish Marshall is no stranger to dedication to her husband and family. It was only a matter of time she would fall in love with the dedication that is the sport of Triathlon, regardless of the fact she had zero athletic background. Her love of the sport blossomed in the hot summer months of 2006 where she claims she “learned” how to run. 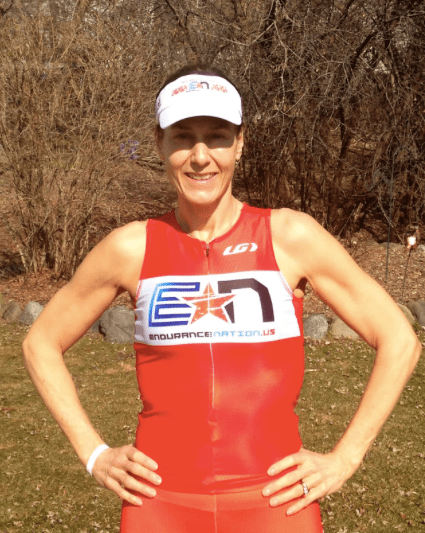 She joined Endurance Nation in 2013 after a disappointing long course season with a one-on-one coach. In the years since, Trish is now a 5x Ironman finisher. She has raced in 2 ITU World Championships, and 1 IM 70.3 World Championship. Her big race this year will be completing her 6th Ironman in Chattanooga, TN this September. Plans Plans and more Plans: Want to run an ultramarathon, marathon, short course triathlon, Ironman 70.3, Ironman, or the Disney’s Goofy Challenge? Yep, there’s a plan for that. EN offers plans for beginner, intermediate and advanced to suit all types of athletes. Wicked Smart Members: The EN website has members who are designated as wicked smart or WSM. These folks are deeply immersed in our sport with years of experience training and racing, AND willing to help us all out in the forums. It is a great resource on just about any topic you can think of. Training plan weekly podcasts and videos: Each training week has an informative video which cover a range of topics like, fatigue, nutrition, recovery and testing. Weekly office hours and biweekly twitter chats: These are opportunities to tune in and have questions answered by one of our coaches live. If you can’t join in they are all archived for you, so its a win win! Race Specific Webinars: This is a GREAT tool especially if you can’t get to the course to train ahead of time. The coaches have detailed notes on not only what to expect, they will teach members how they would race. Race plans and race reports from members: I love reading race reports for information and inspiration. EN encourages all athletes to prepare a race plan and post in the forums for feedback. I have learned so much from both of these resources. THE WIKI! This is the big kahuna. An encyclopedia of triathlon information designed to make you a smarter self coached athlete. While it may be a bit intimidating how MUCH info is there, this is the place I repeatedly turn to (on my schedule, when I have time) to learn more about race execution, nutrition, pacing etc. You can dive as deep as you want. It’s in there. The Haus and TEAM EN: Really, it’s the people. In the EN Haus, there is a shared love for the sport, and wealth of knowledge. The friendships and shared experience are real. I love meeting folks face to face at team dinners for races after training virtually with them! I’ve made some great friends in the last couple years. The Coaches: Coach Patrick and Coach Rich have a passion for what they do. They have deep experience coaching. They do what we do too! BUT, they don’t think that they are the end all be all. They have created a place where members can share, collaborate and grow their knowledge base of all things triathlon in the Haus.